A collaboration between the University of Maine at Presque Isle and SAD 1’s Adult and Community Education program already is seeing its second crop of students graduate and help fulfill a crucial workforce need for Aroostook County. PRESQUE ISLE, Maine — A collaboration between the University of Maine at Presque Isle and SAD 1’s Adult and Community Education program already is seeing its second crop of students graduate and help fulfill a crucial workforce need for Aroostook County. Since fall 2017, UMPI’s medical laboratory technology program and the SAD 1 Adult and Community Education program have worked together to teach a 10-week certification course in phlebotomy to students interested in entry-level work in the medical field. Phlebotomists are responsible for correct identification and labeling of specimens and patient information in hospital and medical clinic laboratories as well as collecting the appropriate amount of samples for each test. As in the nursing field, there are more phlebotomists retiring in Maine than there are students graduating with the necessary certifications, according to Leigh Belair, assistant professor and director of the MLT program at UMPI. Until the university collaborated with SAD 1, there was no phlebotomy certification program located north of Bangor. One of those students in the fall 2018 session is Desiree Ouellette of Presque Isle, who decided to pursue phlebotomy after taking a break from nursing school to care for her daughter, who is now almost 3 years old. Ouellette is nearly finished her required 100 hours of clinical training, which she has done at both Northern Light A.R. Gould Hospital in Presque Isle and the Pines Health Services clinic in Caribou. Ouellette has applied for a part time position as a phlebotomist at Northern Light and a full time position as a medical assistant at Pines Health Services. She currently works part time as a direct support professional for Personal Services of Aroostook and is still debating whether she will stick with her nursing studies or pursue a medical laboratory technician degree from UMPI. 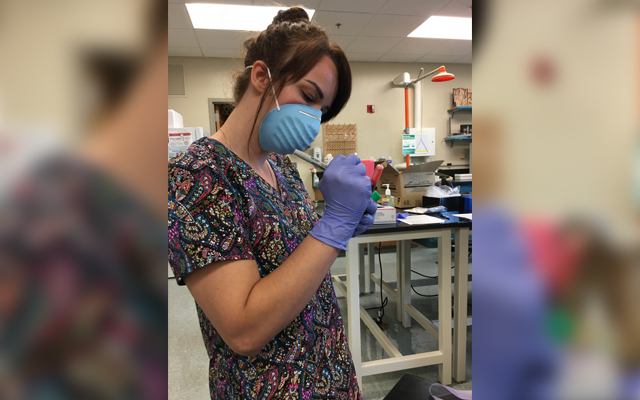 If she decides on an MLT pathway, Ouellette’s phlebotomy certification would earn her three college credits that would transfer to UMPI’s program. Students in the phlebotomy certification program complete 40 hours of classroom training in addition to their 100 hours of clinical experience, which have to include 100 successful unaided blood collections such as skin punctures and venipunctures. Belair teaches laboratory courses at UMPI while LeRae Kinney, director of SAD 1 Adult and Community Education, holds workshops on study skills, time management and effective test-taking skills. The collaboration between UMPI and SAD 1 began when Belair and Kinney met during a Healthcare Sector Partnership meeting at the Presque Isle Career Center to address County workforce needs. Adult and Community Education also provides students access to the program’s computer lab and printer at Presque Isle High School from 8 a.m. to 9 p.m. and collects applications and textbook payments. Ouellette said she has valued being able to complete her clinical training at two medical settings so that she could learn the differences between being a phlebotomist in hospitals and outpatient clinics. She also received financial assistance from the Aroostook County Action Program’s youth workforce program for students aged 18 to 24, which helped her purchase scrubs, medical supplies and her textbook. That same program, as well as ACAP”s career center, can provide tuition assistance for students who decide to pursue their MLT degree from UMPI. “The clinics have been a great hands-on experience and they’ve really allowed me to take on most of the procedures on my own,” Ouellette said. UMPI and SAD 1 are looking to possibly extend the phlebotomy course with a spring session, but plans are uncertain due to local hospitals already providing clinical training for nursing, MLT and CNA students. The fall session runs from August to late November and those who are interested can obtain applications from the SAD 1 Adult and Community Education program, the Presque Isle Career Center or the Aroostook Centre Mall. “This is an example of a true collaboration between educational partners,” Belair said.